I added a Nordicware mini bundnt pan to my treasure chest of bakeware. What should I bake to do justice to this beautiful pan? 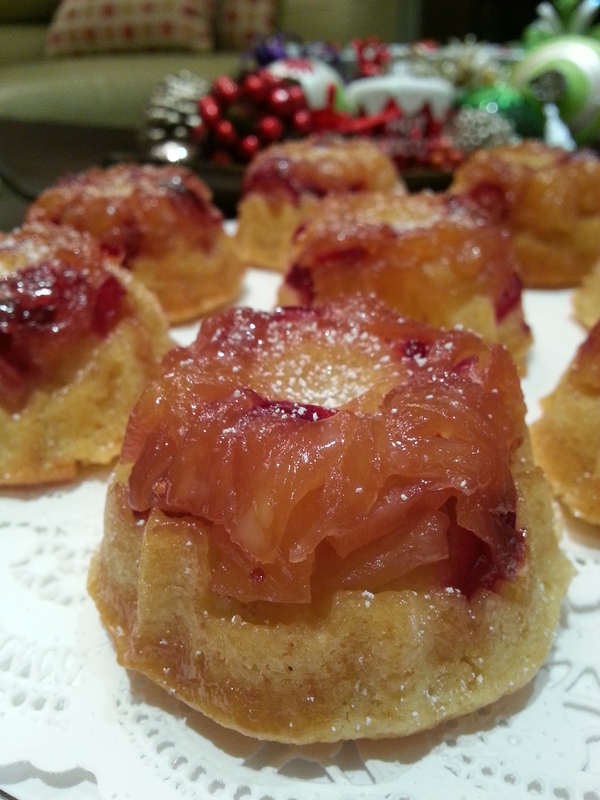 Mini pineapple upside-down cake! For the longest time, I have been baking them in a 9-inch round pan. It is time to try something new. I also added some chopped cranberries as substitute to the usual poached cherries. They turned out beautiful and made a great holiday gift. Mix chopped pineapple and cranberries in a bowl. Divide into twelve portions and spoon into the molds of the bundt pan. Spread evenly across the bottom of each mold. Add the brown sugar and stir until small bubbles appear, 2-3 minutes. Remove the sugar mixture from the heat and add the pinch of salt, stir well. Divide the caramel sauce into twelve portions and spoon over the pineapple and cranberry mixture. Set aside. Sift flour, baking powder, salt, and nutmeg into a bowl. In another bowl, whisk the eggs with the vanilla. Set aside. In a standing mixer fitted with the paddle attachment, beat the butter until pale and fluffy. Gradually add the granulated sugar and beat for 2-3 minutes longer. Slowly add the egg mixture, beating after each addition. Spoon half of the flour mixture into the butter mixture, stir, add half of the milk, and stir again. Add the remaining flour, stir, and add the remaining milk. Continue stirring, scraping down the bowl as needed, until the batter is completely smooth. Do not over-mix. Spoon the batter over the pineapple and caramel sauce mixture in each mold, spread evenly. Fill each mold with batter up to a ¼ inch from the rim of the mold. Bake until the top of the cake is lightly golden and the center springs back when touched, about 25-30 minutes. Let the cakes cool in the pan on a wire rack for 5-10 minutes, then turn them out onto a platter and scrape the remaining juices over the top of the cakes. Let cool slightly and dust with powdered sugar. Serve warm.